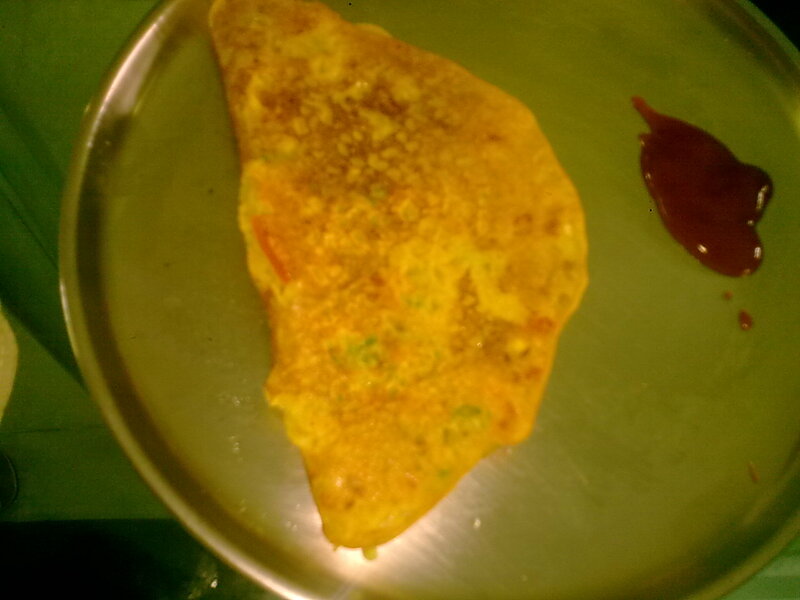 This is referred to as an omelette but it contains no egg :p It is a famous breakfast dish in Maharashtra and I had it in Pune for the first time.It is also known as besan ka chilla in parts of northern India.It is a very easy,tasty and filling snack which can be served anytime..
Cut the onion,chillies and tomatoes finely. In a large bowl mix the chickpea flour,rice flour and sooji together. Add hing,jeera,coriander,turmeric powder,salt,coriander leaves to the above flour. Slowly add water as per the desired consistency.The batter should be a little thick and not as thin as a dosa batter. Drizzle few drops of oil and pour the batter to form an omelette. Once done, turn it, and sprinkle some oil and let it cook on the other side.